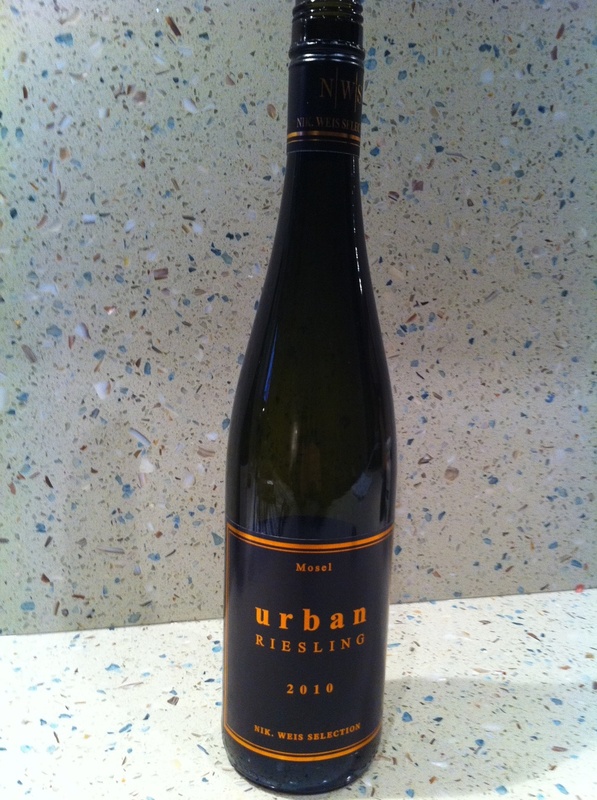 So here is episode #5....2010 Urban Riesling from the Mosel! Cubby was over so I thought I would have him in this episode as well! We always have a fun time together and I hope you enjoy watching us! We also did a fragrance review so you can check that out at www.FragranceTalk.com! As I said above, this was a 2010 German Riesling called 'Urban Riesling' from the Mosel (which is a wine region in Germany). This bottle retails at Legacy Liquor here in Vancouver for $23.25. Germany is known for their rieslings. In fact, some would likely say that Germany is the home of Riesling. Ok, so here is my review. On the nose I got an instant smell of fresh ripe green apples. It smelt like delicious apple juice! We also picked up some smoke and floral notes. Which was pretty bang on as the back of label states "racy and spritzy with ripe aromas, smoky and floral on the nose, with brilliant fruit and the typical Mosel slate minerality" and I would like to point out, I just read the back of the label now...after we did the tasting. So the label was pretty accurate on this one! The only thing I didn't pick up on was the minerality. Smelling it now, I can smell it, but it didn't jump out at me. The minerality comes more on the back of the nose and I found because the ripe apple smell was so predominant, the minerality notes are a bit more muted. On the palate, it was delicious apple juice! The flavour lingered in my mouth for awhile which is good (as long as it's not a crappy wine! Thank goodness this one is YUMMY!). I also got a nice creamy flavour as well. Cubby said this reminded him of an apple orchid with ripe apples that had fallen to the ground. At one point I think he even said rotten apples....but a good kind of rotten apples?! (I guess Cubby likes the taste or ripe rotten apples...heehee). On a serious note, there was a really nice ripe apple flavour to this wine. And on another serious note, there are some wines (desert wines) that are made from grapes that have rotted (noble rot). So I guess it's not really that far out to think or imagine rotting fruit when it comes to wine! Cubby is such a pro at this already and he doesn't even know it!! I initially chose this wine as I'm hoping to find some wines that would be good for all the Christmas dinners coming up. I think this one would work nicely as I think most people would enjoy drinking this wine and I think the wine itself is full enough to carry through a Christmas meal with turkey, ham and all the fixings! I hope you enjoyed watching/reading this review as much as we had doing it! I already have my next wine all ready to be reviewed. This time it's a red wine that I'm hoping will pair nicely with Christmas dinner too... BEAUJOLAIS!!! I will be reviewing one from Villa Ponciago. So tune in next week for that review! Thanks for stoping by and I hope you've had a wonderful weekend! And if you have a moment...leave a comment and let me know what you plan on drinking for this holiday season!! !